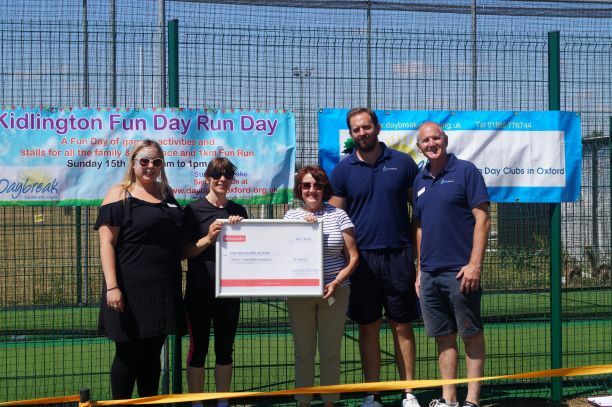 Thank you to Legacy Leisure who provided Daybreak with a grant for £300 towards the costs of our recent Fun Day in Kidlington. The cheque was presented by Neil Appleby, the Centre Manager at the Kidlington & Gosford Leisure Centre, on the right, along with Luke Brennan, Fitness Coach (2nd right) and Laura Pitts, HR & Social Media (on the left), who gave the cheque to fundraisers Laura Bristow and Lindsay Manifold. This grant helped to cover our costs and make the event possible, so we are very grateful for the support given to us by Legacy Leisure.